Ross Dregde and Wendy Montrose wanted to live a more environmentally friendly life. 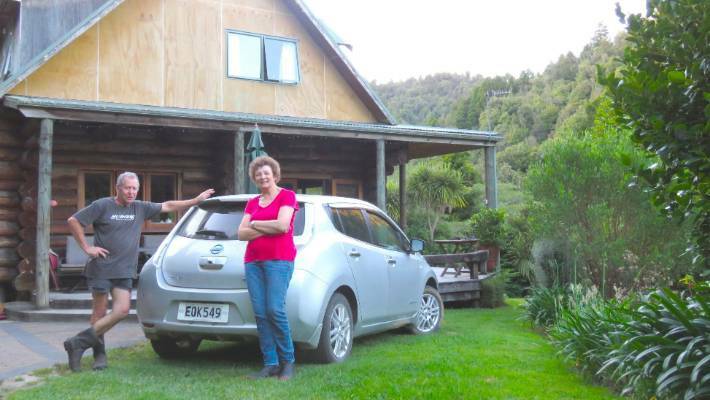 Living off the grid hasn’t kept a Bay of Plenty couple off the road in their electric car – and it’s all thanks to a bit of Number 8 wire Kiwi ingenuity. Wendy Montrose and Ross Dregde​ bought their rural property in Manawahe 23 years ago, and while it boasts all the usual electrical goods – and even an electric car – it’s totally off grid. “When we first bought the farm we knew it wasn’t connected to the electricity network,” said Montrose. 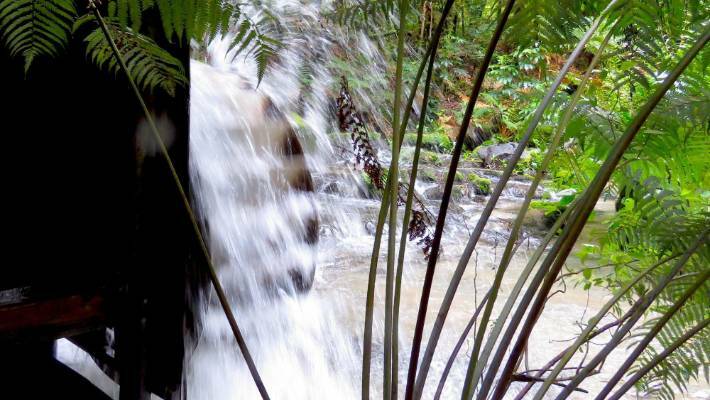 The water wheel Rotorua couple Wendy Montrose and Ross Dredge use for power, including their electric car. Montrose admits to a few false starts, but they now have a reliable source of power thanks to an aluminum water wheel put together by Dregde at a cost of around $1000. However, their recent purchase of an electric Nissan car – again with an eye of the environment – created a problem. “Our water wheel was providing plenty of energy for day to day activities at home, but we realised once we’d bought our electric car we needed to increase the storage capacity of our system,” Montrose said. Luckily, Steve Greenwood from Drive EV, the man they acquired the car from, had an idea. He connected the couple to a supplier of used Nissan Leaf batteries, and soon 49 battery modules and an invertor, which cost $12,000, arrived in seven wine boxes. Montrose admitted the system took some time to work out, but now they have more than enough power. She also said the set up is a third of the cost of lead acid batteries typically used in ‘off the grid’ set ups.